New research from Rutgers Robert Wood Johnson Medical School suggests that gut bacteria at young age can contribute to Multiple Sclerosis (MS) disease onset and progression. In this study, published in the October 31 issue of the Proceedings of the National Academy of Sciences, Sudhir Yadav PhD, a neuroimmunology post-doctoral fellow in the laboratories of Drs. Kouichi Ito, associate professor of neurology, and Suhayl Dhib-Jalbut, professor and chair of neurology, tested mice that were engineered to have a pre-disposition for MS. Because mice would not normally develop MS, researchers used MS-associated risk genes from real patients to genetically engineer mice for this study. Dr. Ito created this unique model of genetically engineered mice to specifically study the cause of MS.
At first, when the genetically modified mice were put in a sterile, germ-free environment, they did not develop MS. When exposed to a normal environment that would normally contain bacteria, the mice did develop MS-like disease and inflammation in their bowels, suggesting gut bacteria is a risk factor that triggers Multiple Sclerosis disease development. The study showed a link between gut bacteria and MS-like disease incidence, which was more prominent at a younger age, when MS is also more prevalent. The younger mice were more prone to develop MS than the older mice. Together, age, gut bacteria, and MS-risk genes collaboratively seem to trigger disease. This study is also the first to identify mechanisms by which gut bacteria triggers changes in the immune system that underlie MS progression. 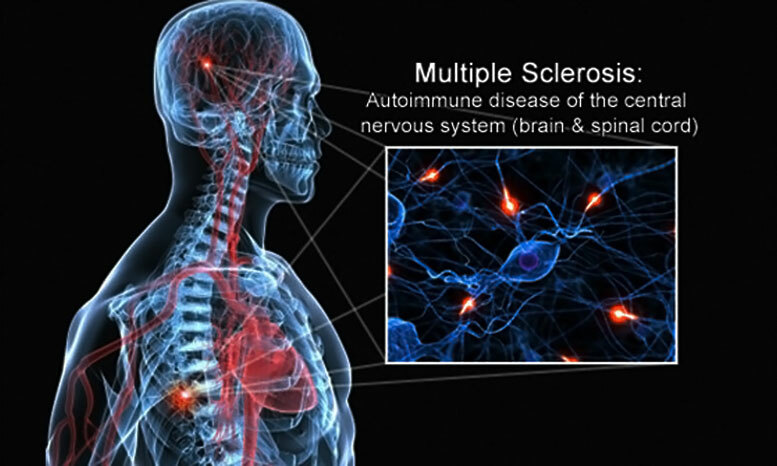 “The findings could have therapeutic implications on slowing down Multiple Sclerosis progression by manipulating gut bacteria,” says Suhayl Dhib-Jalbut, Director of Rutgers-Robert Wood Johnson Center for Multiple Sclerosis. Future research could lead to the elimination of harmful types of gut bacteria that were shown to cause MS progression, or conversely enhance beneficial bacteria that protects from disease progression. The investigators recently received NIH funding to examine their findings in MS patients. Be the first to comment on "Research Shows Age and Gut Bacteria Contribute to MS Disease Progression"